Blood Rage is a very rare and seldom seen slasher film that apparently was shot in 1983, but wasn’t released until 1987 in a very limited theatrical run under the heavily edited title Nightmare at Shadow Woods. 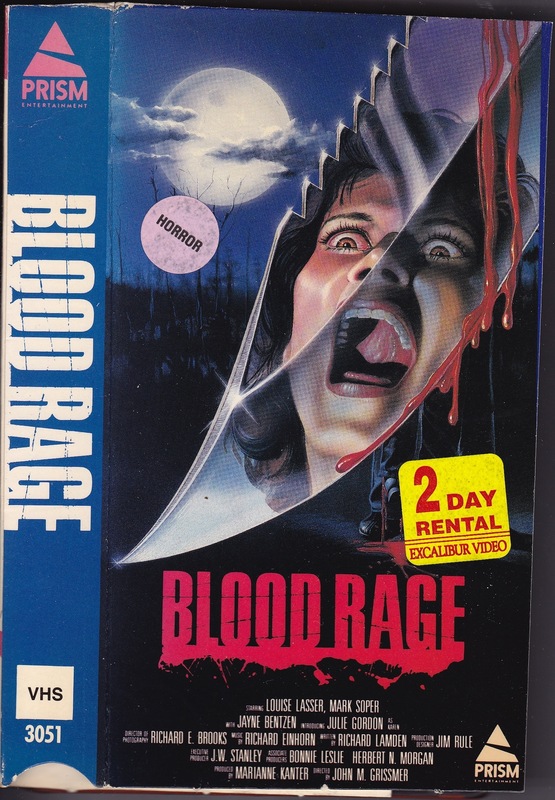 Blood Rage since has received a VHS release, which is now long OOP and also a heavily cut DVD also under the title Nightmare at Shadow Woods, which is also long OOP, and I saw the film on YouTube in its uncut form, which was taken from an old VHS as quality is rather poor. 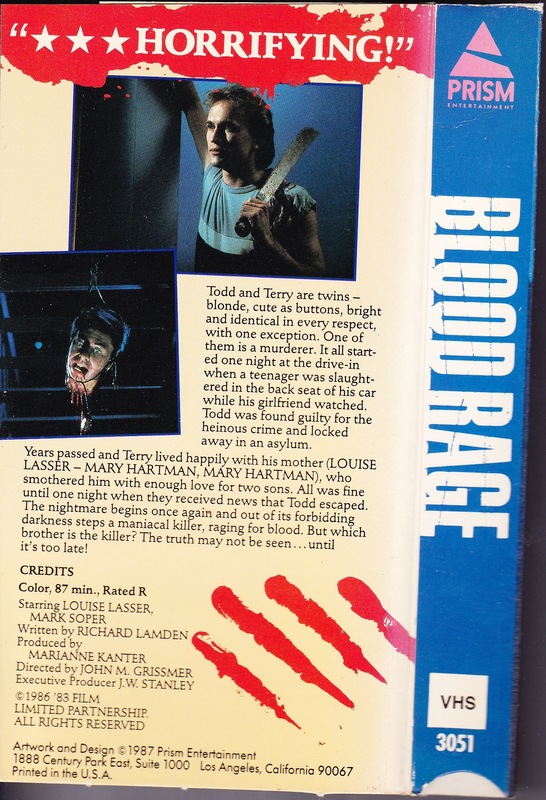 After watching Blood Rage it’s quite easy to understand why it’s so rare and seldom seen since the film is rather dire and about the only real positive aspect it had going for it is fairly decent gore F/X by Ed French. Todd (Soper) escapes from an asylum 10-years after he was sent there for a brutal murder, which was actually done by his twin brother Terry (Soper in a double role). Terry than decides to go around killing people since everyone will assume its his escaped mental patient brother. The script was written by Bruce Rubin under the name Richard Lamden and if I were him I’d also use an alias. Blood Rage slightly strays from the typical slasher formula (and that’s not really a good thing). This doesn’t feature a masked silent killer and even in films where the killer doesn’t wear a mask their face was still hidden or mostly hidden with the exceptions being films like Maniac. The basic set up is also different than say something like Halloween, however it does feature the usual set up in terms of characters. 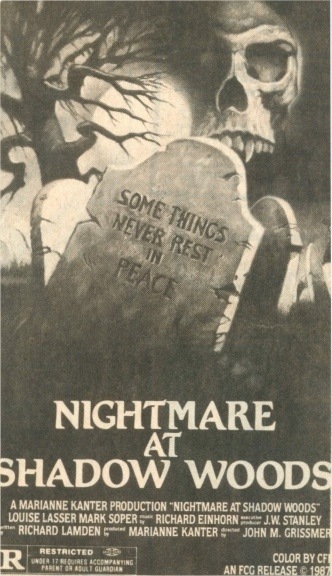 Now with all that said don’t expect anything really original as the script still features many of the slasher movie cliches. To say the script is poorly written would be a major understatement. The film is horribly plotted with some of the most bland characters seen in a slasher film, which is really saying something since slashers aren’t really known for characters. At times the script is a bit over dramatic, which has more to do with Louise Lasser’s acting and other times the script wants to be light and fun though at times it’s just poor writing. The script for Blood Rage is really poor and sure horror films in particular slasher movies aren’t always known for great writing, but this is bottom of the barrel. Director John Grissmer only makes more of a mess out of the film. Granted he didn’t exactly have a great script or cast, but Blood Rage is horribly paced and devoid of any suspense. Each scene is as poorly set up as the last and the death scenes fail at brining any excitement. While there is some decent gore at times it hardly makes up for how poorly the death scenes are staged. Grissmer only has one other directing credit and that’s a film called False Face from 1977 and its really not a surprise Blood Rage was his last credit. Blood Rage is so horrible it does sort of make the film a tiny bit of fun, but for the most part it’s just a bad film. To get any possible enjoyment you just need to not focus on anything and just ride with the idiocy such as Todd’s doctor thinks it was Terry who actually committed the murder 10-years earlier and why Todd never spoke up is beyond me. Maybe it was mentioned who knows. The film is so forgettable for the most part it was tough to pay full attention. As I mentioned the gore F/X by Ed French was really the only decent part of the film and French would actually continue to work as he was involved in such films as Terminator 2, Terminator: Salvation and Midnight Meat Train. I also have to give credit to Mark Soper who is actually pretty good and it almost feels like two different actors. After watching Blood Rage it comes as no surprise that its long forgotten as it truly was a rather terrible film. Slasher fans will still wanna check this out just for the sake of it, but I can’t see many feeling any differently than I did. Based on the very few reviews out there it seems Blood Rage has a small cult following, which I honestly think has more to do with how seldom seen it is. The more underground a film it seems the few reviews are often positive. With a horrible script and horrible directing with very poor pacing and equally as poor set ups on the deaths Blood Rage is pretty much bottom of the slasher film barrel and as much as I love slashers lets be honest there is a lot of junk out there, but this one is easily contender for worst slasher film of the 80s! At least films like Last Slumber Party are fun unlike this mess. This isn’t Ed Wood bad where its really fun Blood Rage is mostly a bore. The scariest thing though is if I could come across a better copy I’d be open to watching this again, which is more terrifying than anything in the film. The only real highlight is the cameo by Ted Raimi in the opening of the film as the Condom Salesman. We all gotta start somewhere even in terrible films like Blood Rage.